Redcurrant meringue muffins - NOURISH TO PERFORM. Growing up with a grandmother who seriously enjoys cooking traditional Austrian dishes and baking delicious cakes is an experience I wouldn’t want to miss. I guess my Mum and my grandmother are the ones who inspire me until today and got me into cooking and baking. While my grandmother just cooks her traditional staple dishes to perfection and my Mum loves to cook more fancy and excellent dishes, I love to experiment and try new stuff. Having to cut out various foods due to m health, challenges me to convert old things into new ones or create totally new stuff. Every time my grandmother asked me which cake I wish for my birthday or a special occasion I answered with „chocolate banana“ or „redcurrant meringue“. 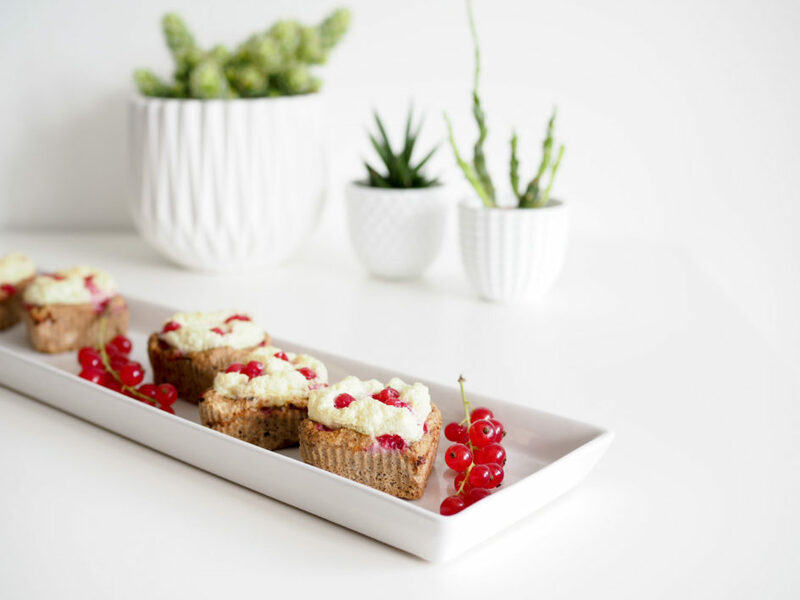 As redcurrant are in season right now, I tried to bake a paleo redcurrant meringue cake and I have to say that it turned out to taste heavenly! Using chestnut flour somehow gives those muffins that perfect sweetness and harmonizes with nuts! If you don’t have access to chestnut flour, you can also use more ground chufa or nuts but I think chestnut gives the extra kick! I love it when all the different flavors come together in my mouth: sour redcurrant, nutty almonds, sweet stevia and vanilla and all of that topped with a sweet and sour lemon meringue! I dare you all to try this recipe! Is there any cake that reminds you of your childhood or that a family member is/was famous of baking? Let me know and perhaps I’ll try to make a paleo and if possible vegan version. sweetener of choice/Süße nach Wahl I used stevia powder./Ich habe reines Steviapulver benutzt. 2 egg whites/Eiklar I used 70ml liquid egg whites/I habe 70ml flüssiges Eiklar benutzt. sweetener of choice /Süße nach Wahl I used stevia. (e.g. powdered erythrit)/Ich habe Stevia verwendet. (Erythrit Puderzucker funktioniert auch wunderbar). Preheat the oven at 180' C./Den Ofen auf 180 Grad vorheizen. Mix dry ingredients and add egg yolk and almond milk../Die trockene Zutaten vermengen und Eigelb und Mandelmilch hinzugeben. Whisk the egg white until stiff and fold into the dough./Das Eiklar steif schlagen und unter den Teig heben. 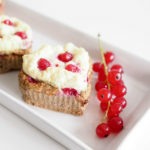 Fill the dough into muffin tins and topp with redcurrants./Den Teig in Muffinförmchen füllen und Johannisbeeren darauf verteilen. Bake for about 20 minutes./Für etwa 20 Minuten backen. Whisk the egg white with sweetener and lemon peel until stiff./Das Eiklar mit Zitronenabrieb und Süße steif schlagen. After 20 minutes of baking, top muffins with egg white and some redcurrant and bake for another 10 minutes./Nachdem die Muffins 20 Minuten im Ofen waren, die Baiserhaube und ein paar Johannisbeeren darauf geben und nochmals 10 Minuten backen. Switch ground almonds for 10g ground chula, 5g chestnut flour and 5g sunflower seed flour./Die 20g gemahlene Mandeln einfach durch 10g Erdmandeln, 5g Kastanienmehl und 5g Sonnenblumenkernmehl ersetzen.